Jews are known as bright people. In fact, we've been a people of books and wisdom for 4,000 years. Which makes for a lot of books and wisdom. What kind of wisdom? Well, there's the basic what-to-do-and-what-not-to-do stuff. Then there's the stories and legends. And there's the real deep what-is-life-all-about wisdom, including the secrets of the Kabbalah and Chassidic masters. It's all there waiting for you. In fact, it's your personal heritage. It's called Torah. Torah shares the same etymology as the Hebrew word orah, "light"—its teachings shine a light on life and show you which way to go. And its study is a mitzvah—actually, the greatest mitzvah we have. "You shall teach [it] to your children and speak its words when you sit in your house, when you walk on the way, when you lie down and when you rise"—Deuteronomy. 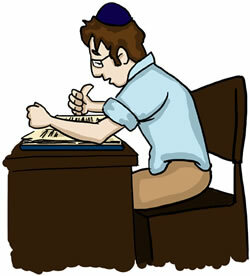 Its study is a mitzvah—actually, the greatest mitzvah we have.A Jew is always studying Torah—24/7/365. We take breaks to eat, sleep, pray, make a living and reenergize. The remainder of the time we connect to G‑d through studying His wisdom. The minimum requirement is that you fix some time for study once a day and once a night. Can't devote as much time as you'd like? Support a yeshivah and be a partner in their study. The rich and the poor, healthy and sick, old and young, smart or dim. Torah is every Jew's personal heritage. "It is not your job to finish the task, but neither are you free to absolve yourself from it..."—Ethics. Start with the rules that impact daily life, Shabbat, holidays, etc. And then keep on learning; there's more than enough material to last several lifetimes. Articulate the words you study. Allow the holiness to impact and refine your body. Join a class at your local Chabad House. Get online to a Torah learning website, like www.chabad.org. Study one-on-one with a scholar. Click here for details. Why Get So Caught Up in Torah's Details? I would like to express highest gratitude for the work you do, and for the way you have put it in.